Emus4u is one of the best iOS app installer available in the market, it let you download your favorite Cydia tweaks. As there is a slowdown of jailbreak release you must be looking for the alternatives to get your favorite apps and games for the iOS device. There is no doubt that Emus4u can be the best alternative for your device for its user-friendly interface. The best part of Emus4u is that it doesn’t require your device to get a jailbreak. Even it does not require your Apple ID, that means your information is safe and it will not void your Apple warranty. Download it on your latest iOS device and get all the content for free. If you found issues with the Configuration Profile of Emus4u, then we will help you to fix the Emus4u Profile Installation Failed Error below. 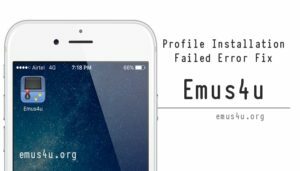 If you want to install Emus4u ( About ) on your device, the installation process is very simple but sometimes due to high traffic volume on the server, you may get Profile Installation Failed Error. Basically, if you get an error then you will get two common types of error, although both the error can be fixed by following a few simple steps. First time if you are trying and it is not working then try after some time, the error might be fixed. When you will try after some time and the error still persists then you need to clear your device. Follow the below instructions to clear your device cache. Put on the device Airplane mode. Find the option Clear History and Website Data. Now turn off your device Airplane mode and wait for a few minutes. Once the errors are fixed, you will be able to install Emus4u on your device. But remember not to expect the same functionality as Cydia. Hope you have enjoyed Emus4u on your device, let us know to comment below your experience and to get more relevant updates to follow us on Facebook. Profile installation failed error worked well in my device and it is fixed. Sorry, but I did not get the screenshots yet.